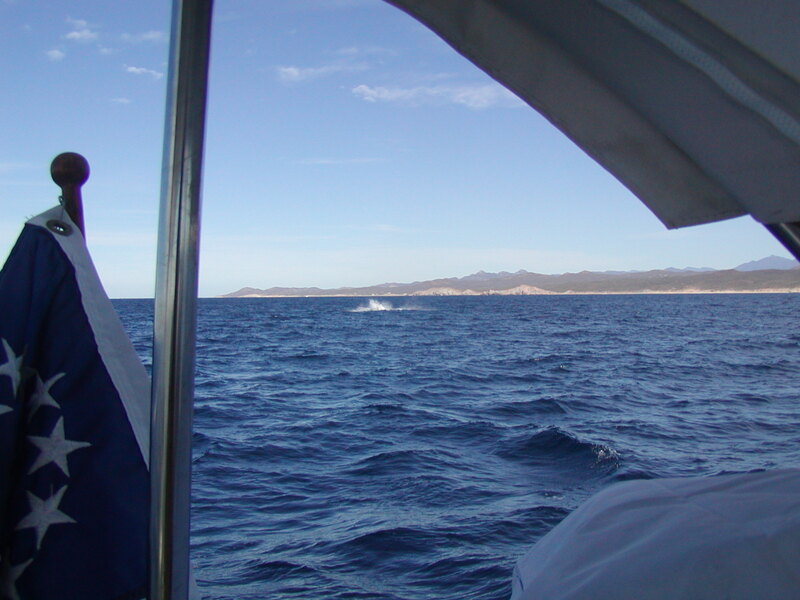 January 7, 2004 to January 8, 2004: 165 nautical miles: dolphins, whales breaching, birds, Cabo San Lucas rocks! 1000 January 7, 2004: Left heading 150 degrees averaging 6.5 knots motoring. Wind direction 90 degrees at 7 true knots..
0500 Sailing under a full moon. 0700 Sunrise over Cabo San Lucas. Bright, Warm, dolphins next to boat. Temperature is 72 degrees (finally). 1000 Arrived Cabo San Lucas rocks. Put in at Cabo Marina for $96/day! Whoa! Security, satellite T.V. hookups, water, electricity, stores, etc. Booked into a resort under the "time share" prices by going to the time share 90-minute show. Stayed three days. Currently back on boat until Wednesday, at latest, January 14, 2004. Then, off to either Mazatlan or Puerto Vallarta. yet to decide. See pictures below. Whale slapping. Picture given to show you how close/far the whale(s) are/were from the boat. Next ones show nice action. More was to be seen for 20 minutes, but photo abilities lacking on taking exact pictures. Have LOTS of video though! The dolphins are a regularly daily event, seeming to guide us to every destination. We have now gotten books to identify the types of whales and dolphins. Need a book called Fish of the Pacific but can't find it anywhere here!